The opportunity to do just that was present at the 45th Tokyo Motor Show when Mazda unveiled two concepts models that encapsulate the upcoming evolution of the KODO—Soul of Motion design philosophy. When KODO Design debuted on the SHINARI concept sedan in 2010, it was highlighted by two sweeping curves that ran alongside the body, gently intersecting with one another. In its latest evolution, KODO has been refined to a single “one motion” curve, referred to as “The Speed of Light,” as it uses a subtle concave shape to illustrate dimension and how light plays against the sheetmetal. “The reflection of light over the surface flows linearly with the movement of the car, creating a vehicle that seems truly alive. The predominant highlight on the body shoulder is strong and sharply-styled, emphasizing a powerful physique, while softer, more elegant light patterns shimmer across the empty spaces extending over the vehicle,” said Ikuo Maeda, global design chief of Mazda Motor Corporation, referring to the Mazda VISION COUPE concept. The VISION COUPE, a large, grand touring vehicle, highlights “Mazda Elegance,” a term the global design team uses in complement to the “Mazda Premium” direction the brand is taking as it elevates its vehicles and their positioning. “Mazda Elegance” focuses on a less-is-more approach to design, distilling lines to just what is essential, letting the light interplay with the body of the car. Inside both the VISION COUPE and KAI CONCEPT 5-door hatchback, the cars share a similar theme, taking large central displays out of focus in favor of enjoying the natural space of the interior. The future of KODO Design, displayed both on the compact Mazda KAI CONCEPT and large Mazda VISION COUPE, shows the versatility of the most modern interpretation of the theme without either car being a cookie-cutter of the other. 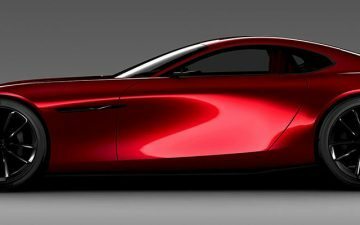 In fact, if you include 2015’s award-winning Mazda RX-VISION concept in the mix, it becomes even more evident that a sports car, a compact hatchback and a large sedan can all share the family resemblance, suggesting that this design language should translate well across the Mazda lineup. But what of these concept cars? Are they heading to production? Will Mazda sell cars straight off the poster hanging on the wall in your dreams and into your driveway? There’s plenty to come, showing what the future will hold. While the next-generation cars are waiting in the wings of development, what can be said is that the future of Mazda Design is bright, and it begins now.